Locally trained dance professional Philip Channells is returning to the Northern Rivers after gaining international recognition for his inlcusive dance practice. 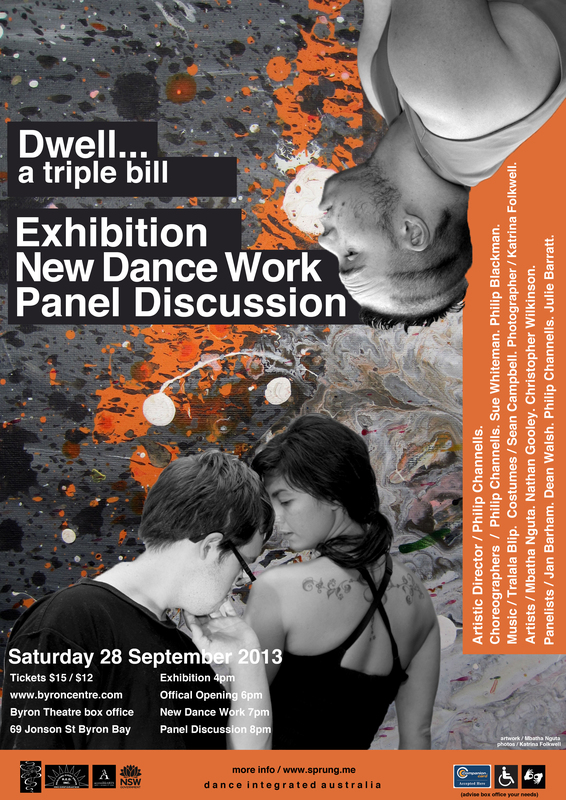 Channells will be collaborating with dancers, visual artists, musicians and local choreographers to produce DWELL – A TRIPLE BILL, a cross art form performance. DWELL – A TRIPLE BILL connects emerging and professional artists with and without disability from the Northern Rivers to create three short dance works, which will be performed at the Byron Theatre on 28 September 2013. This cross art form project includes dancers, visual artists and musicians collaborating to produce a dynamic once off performance. It provides an opportunity for people to engage in an innovative and professional production, which ultimately enhances cultural diversity and social inclusion in the arts. Supported by the NSW Government through Arts NSW and Ageing, Disability and Home Care, the collaborators: Sprung!! Integrated Dance Theatre and R.E.D. Inc. have invited Philip Channells, Creative Director of Dance Integrated Australia to lead this exciting new creative adventure. Channells graduated from Lismore’s Northern Rivers Conservatorium of the Arts in 1998 and has become one of Australia’s leading experts in inclusive dance practice. “R.E.D. Inc. sees participation in the arts as a powerful way to enhance social inclusion and to create opportunities for people with disabilities. We are excited about the opportunity to collaborate with Sprung!! and professional artists, dancers and musicians on this project. Collaborative events such as this strengthen connections within communities and contribute to social change,” says Marie Gale, R.E.D. Inc. CEO. Based in Adelaide, Channells brings back to the Northern Rivers region his international experience of disability-inclusive dance development. Joining the choreographic team will be local dance artists Sue Whiteman (Alstonville Dance Studio) and Philip Blackman (Associate Artist NORPA). Following initial creative explorations in April, the choreographers will continue to respond to and interpret the artwork of local R.E.D. Inc. visual artists Mbatha Nguta, Nathan Gooley and Christopher Wilkinson in a week-long workshop in September. Local musicians Tralala Blip have been commissioned to produce the soundscapes for the production. Bringing all elements together on Saturday 28 September 2013, an exhibition of the art works, which provided initial inspiration for the movement, will officially be opened at 6pm upstairs at the Byron Community Centre. DWELL – A TRIPLE BILL will be performed at the Byron Theatre 7pm. To complete the program, there will be an open public forum and Q&A immediately after the performance. This is an opportunity to meet the artists and guest presenters including Sydney-based environmental campaigner through dance, Dean Walsh and Jan Barham, MLC and president of the NSW Greens with the Arts and Disability Portfolio. This once off cross art form project has something for everyone. It will provide an exciting, entertaining and informative professional creative experience for all involved. For media enquiries, please telephone Project Manager, Moondi Nelson on 0432 622 654. To speak directly to the project’s artistic director Philip Channells, telephone 0422 375 725.